Deutsch: Das Dramadreieck besteht aus den drei Beteiligten: Opfer, Täter und Helfer. Der Mediator beobachtet. 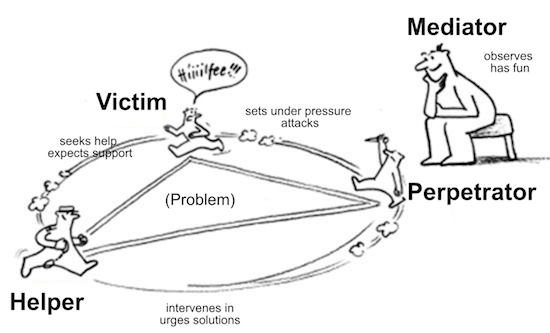 English: The drama triangle composed of the three parties involved: victims, perpetrators and helpers. The mediator observes. To embed this file in your language (if available) use the lang parameter with the appropriate language code, e.g. [[File:Drama triangle - Observer.svg|lang=en]] for the English version. Mediator observed the drama between aggressors, victims and helpers.